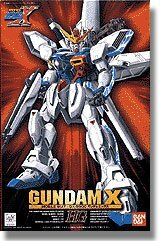 Though the only Gundam program ever to be cancelled before its planned end, this 39-episode series was probably the best-realized vision of an alternate Gundam universe, a sort of Mad Max with mobile suits in which a planet ruined by war and repeated colony drops is dominated by high-tech pirates who roam the land. At the center of the action is Garrod Ran, a fifteen year-old boy who pilots the powerful Gundam X, a weapon of a past age, and the crew of the landship Freeden, who work to find and help psychic Newtypes who struggle to live in this new After War world. Stunning mechanics and endearing characters such as are the trademark of shows bearing the Gundam name are plentiful, as are intense battle sequences and a well-defined story arc - though the end is forced to be brought on too soon due to the show's unfortunate Japanese cancellation. Had it been placed in a better time slot, things may have gone better.